More than 54,000 people crammed into B.C. 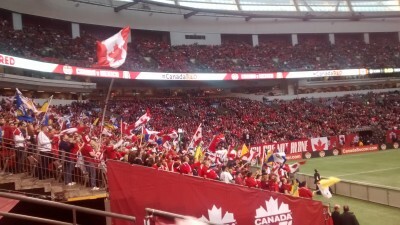 Place Stadium to watch the Canadian men’s soccer team do battle with Mexico this past Friday. 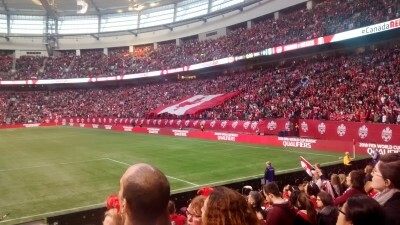 The fans created an atmosphere that I thought I could never find at a soccer game in North America, and despite the home team Canucks falling 3–0 it was a night to remember for anybody that follows the Canadian national soccer team. The crowd set a Canadian record: it was the most people who have ever watched the men’s national team play on Canadian soil. The singing and drumming started at least two hours before kick-off. By the time I had made my way to my seat (which was destined to remain empty for the entire match) my ears were ringing and there was a smile on my face that was going to stay there no matter how many times Mexico found the back of the net. The stadium was packed with people wearing red, although there was more than a smattering of the green of Mexico throughout B.C. Place. While the Mexican fans may have been outnumbered they were determined to not be drowned out. I don’t think I ever truly knew how much noise a person could make until the Mexican national team took the field and everybody wearing green in my vicinity let loose a torrent of sound, the likes of which I had never experienced before. Determined not to be outdone in their own stadium, the Canadian fans rose to the occasion and it’s safe to say that the largest crowd in Canadian soccer history was also the loudest. Unfortunately Mexico ranks 22nd in the latest FIFA ratings, a full 65 places ahead of Canada, and they didn’t allow the Canadian fans much of a chance to cheer. From the outset it was clear that the Mexicans were the far superior team. But the Canadians, emboldened by the support from the crowd, refused to sit back and play a defensive game, instead launching themselves forward to attack every time the Mexican team gave them an opportunity. That offensive strategy led to Canada having a few opportunities in front of the Mexican goal, but also left themselves wide open defensively. Were it not for the heroics of Milan Borjan, Canada’s goalie, the score could have been out of hand after just 20 minutes. It seemed like just a matter of time before the Mexicans took control of the game and the inevitable breakthrough came off the head of Javier Hernández in the 31st minute. The former Manchester United and Real Madrid forward rose up to meet a cross just outside the six-yard box and powered a header past Borjan. Mexico added another goal quickly before the halftime whistle to really take a stranglehold on the match. The rest of the game played out with Mexico playing conservatively and trying to hold possession of the ball while the Canadians fruitlessly chased after it trying to give the massive crowd at least a consolation marker. The game was a qualifier for the next World Cup, taking place in Russia two years from now. Canada and Mexico are in group one of the three groups in the fourth round of the Confederation of North, Central American and Caribbean Association Football (CONCACAF). The top two teams from each group move on to the final round of qualifying. Mexico currently tops group one with Canada just clinging on to second place with the round halfway finished. Despite the loss, the game will be considered a milestone for soccer in Canada. Canada was never really expected to be competitive in this game, and for a team trying to qualify for just their second World Cup in history, having the support of over 54,000 is victory enough.